New cancer survival guide explains with scientific evidence-based cancer information how to improve cancer survival, quality of life, and cancer prevention from Jeannine Walston. Developed over the last 15 years since her brain tumor cancer diagnosis, Jeannine helps cancer patients discover and apply the best cancer therapies and strategies. 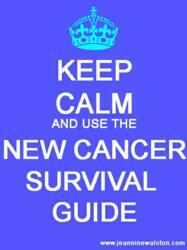 Extensive cancer research created the new cancer survival guide to improve cancer survival in cancer patients and even avoid the disease. New cancer survival guide to improve quality of life, cancer survival, and cancer prevention has been released from Jeannine Walston, a 15-year brain tumor cancer survivor. Cancer patients now benefit from specific cancer treatments explained by Jeannine in her new cancer survival guide at http://www.jeanninewalston.com. “After using hundreds of cancer treatments for my brain tumor and healing, plus working professional jobs for the National Cancer Institute, Food and Drug Administration, National Institutes of Health National Center for Complementary and Alternative Medicine’s Clearinghouse, the U.S. Congress, cancer non-profits, and cancer providers, I learned the answer is integrative cancer care. Research study results show that integrative cancer care improves cancer survival, quality of life, and cancer prevention. Now I help cancer patients find their best cancer therapies and strategies,” said Jeannine Walston. The cancer survival guide incorporates cancer research findings from cancer experts, including Dwight McKee MD, Keith Block MD, Jeanne Wallace PhD, CNC, Dean Ornish MD, Bharat Aggarwal PhD, Lise Alschuler ND, Brian Bouch MD, Jeffrey Bland PhD, Michael Lerner PhD, Andy Weil MD, James G. Gordon MD, O. Carl Simonton MD, Donald Yance, Lora Matz MS, LICSW, Gabrielle Roth, Kris Carr, and others. Pioneer discoveries from those cancer experts about integrative cancer care are featured in Jeannine Walston’s guide to improve cancer survival, quality of life, and cancer prevention. Integrative cancer care combines the best conventional cancer treatments with whole person health and healing. That includes the entire physical body with integrative cancer medicine, mind-body healing, spirituality, social support, and environmental health. Integrative cancer medicine is a core process for healing in integrative cancer care for the whole person. “Conventional oncology has many tools directed specifically against tumors. Complementary medicine contains many techniques designed to alter the body's internal 'terrain', from cancer permissive to cancer inhibiting. Using both of these together is Integrative Cancer Medicine, and more powerful than either approach alone,” said Dwight McKee, MD. As the United States continues to address malfunctions in our nation’s health care such as in the recent film Escape Fire: The Fight to Rescue American Healthcare showed on CNN and a segment by Sanjay Gupta MD, despite some improvements, the overall current situation is a tragedy for the majority of cancer patients. Like Andy Weil MD, Dean Ornish MD, and Wayne Jonas MD explained in the film Escape Fire, conventional cancer care does not accurately and adequately address the cancer diagnosis and cancer symptoms through conventional healthcare covered by health insurance coverage. The new cancer survival guide from Jeannine Walston helps cancer patients cultivate optimal cancer fighting and wellness promoting strategies for the entire physical body and whole person. “Over the next several decades, conventional cancer care will transform into an integrative cancer model. Innovative discoveries and cancer treatments are already available. The cancer survival guide tells cancer patients through educational articles what to do, where to go, and in the process create a comprehensive, individualized integrative cancer care plan,” said Jeannine Walston. Along with the new free cancer survival guide on her website featuring integrative cancer care, Jeannine is available for help as a Cancer Coach, Writing & Consulting, and Public Speaking nationally and internationally. Visit Jeannine Walston’s website for more information. Jeannine Walston provides the best integrative cancer care for the whole person resources through her website of articles, blogs, and services as a Cancer Coach, Writing & Consulting, and Public Speaking. Her comprehensive website addresses body, mind, spirit, social, and environmental health plus resources for navigation and support, including how to create an integrative cancer care plan to improve quality of life, cancer survival, and cancer prevention. As a cancer survivor since 1998, she has extensive experience in cancer education and advocacy, health care policy, and conventional into integrative cancer care through work for the National Cancer Institute, Food and Drug Administration, National Institutes of Health National Center for Complementary and Alternative Medicine’s Clearinghouse, the U.S. Congress, cancer non-profits, and cancer practices. For more information, visit http://www.jeanninewalston.com.